Be careful what you listen to. You know that phrase 'you are what you eat'? Well, your voice tends to mimic (be) what it hears (consumes). If you stop and think about it, the way a baby learns to talk is by listening to other voices. Not only does the child learn language, he/she also learns and assumes the inflections, tone, rhythms and other nuances and characteristics of the voices it hears most often. These different vocal tone and nuance choices are created not only by the shape, density and size of the larynx and resonators but also by manipulating the throat channel. Articulation (pronunciation) is affected by the movement of the articulators including configurations and movement of lips, tongue and teeth. The University of Iowa posts a wonderful picture of many of these changeable and morphable areas here. Here's the thing... there are too many moving parts to vocal sounds to create them manually or separately for long. Yes, we can take the engine apart to examine or re-train a singular movable part, but ultimately our automatic nervous system just goes into automatic when we INTEND to create a certain sound. How do we figure out what to intend? Our ear says... 'match this!'. We can do this on purpose when learning new style or tone choices, or trying to match another voice when singing background. One of my favorite and quickest ways to get up to speed for on-purpose voice-matching is to mime the sound silently until my ear trains my intention. This allows the automatic nervous system to configure the voice for the match. The better your vocal technique, the more movement options your voice has access to, and the closer you can create the match. But we also can do this without meaning to. JUST LISTENING can cause our vocal apparatus to move!! My vocal coach, Gerald Arthur once advised me not even to listen to any music at all when I had laryngitis. I was recovering from vocal injury and strain, and my hard-working session-singer voice needed all the rest it could find. Silence allowed stillness in my instrument! Back when I was touring a lot, I learned to listen not to Cher or scream-rock, but to Barbara Streisand, Sandi Patty and Kiri Te Kanawa in my bus stateroom before I did my shows. I didn't know why, all I knew is that listening to these kinds of voices made a big difference in my own vocal relaxation before even doing my warmups. And by the way... this all holds true for the speaking as well as the singing voice. 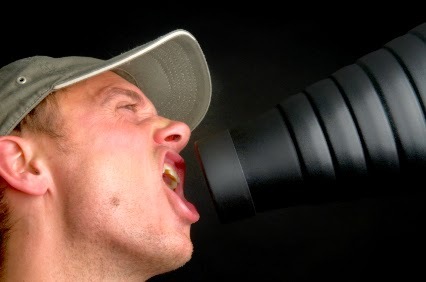 Notice, next time you hear a tight voice singing or speaking, how your own starts feeling the squeeze. Bottom line: Unless you want to learn something, be careful listening to it, ESPECIALLY right before performing yourself. Why? Because your voice dances to the music! You just need recordings of two or three voices that relax your own. Listen actively and be very present with how your throat feels as you listen. That's how you can find your own 'vocal valium' voices. What an interesting idea... it makes total sense to me as a voice teacher, as I can often "feel" the tightness or straining when I'm listening to a student who is struggling, but I never made the connection that this same issue could also cause difficulty for students who listen to music with lots of vocal strain in it. It would be interesting to see if my students who have more issues might also be listening to harsher music! 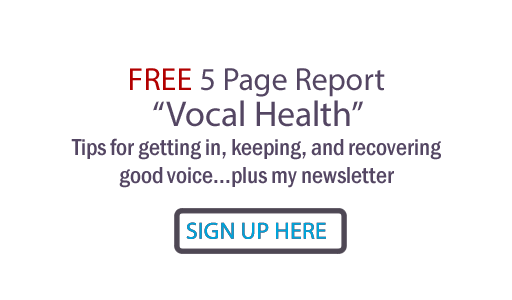 Thank you for sharing your experience with this, too, Sara... yes, this phenomenon actually helps us as vocal coaches to diagnose where the tightness is coming from in our students! Like massage therapists, we coaches do need to de-stress our own voices after working with our tighter clients.